in the container ship  for containers. Transfer of passengers from SkyWay passenger trains in passenger ships. Placement of port  on the shelf in the open sea. The natural depth of the sea in the port is 2030 m and more. Distance from the port to the shore: 110 km and more, as in the territorial waters and beyond. 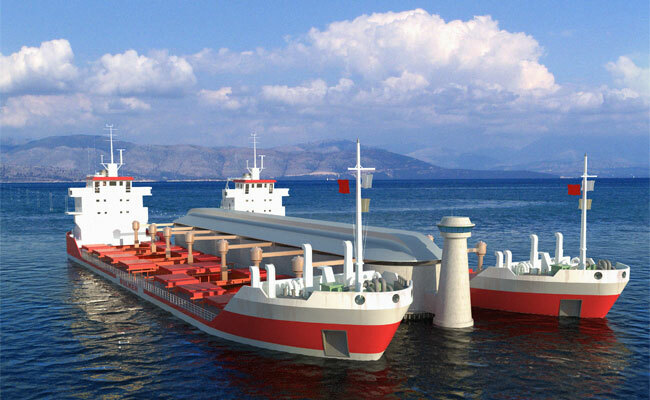 Transshipment volume  up to 250 million tons per year. The number of transit passengers  up to 1 million people a year. Cost of the sea port, excluding the cost of SkyWay road, rolling stock, loading-unloading terminals and infrastructure  from 10 million USD. The possibility of organizing berths with depth of 20 m or more by using natural depth of the sea. No need for large, free and expensive areas on the shore. don't need artificial channels in the port. by reducing the volume of repair work in port. Improving the quality of cargo, especially bulk (ore, coal, etc. ), and increase its selling prices by reducing the number of loading and unloading transshipments. 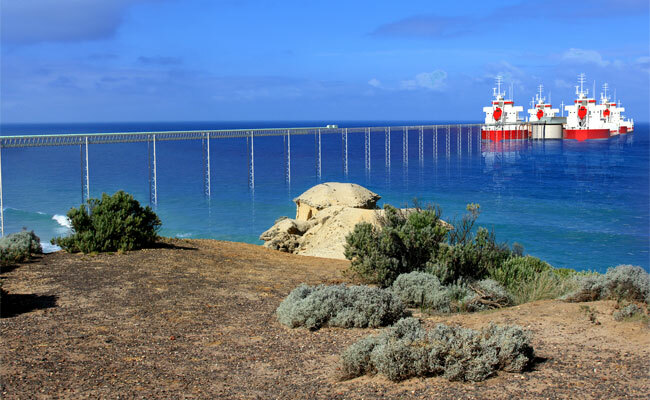 Improving the reliability and safety of all-weather and year-round operation of SkyWay sea port compared to the traditional port on the shore. Low resource consumption and low energy consumption at all stages of the life cycle of SkyWay sea port (design, construction, operation and dismantling). 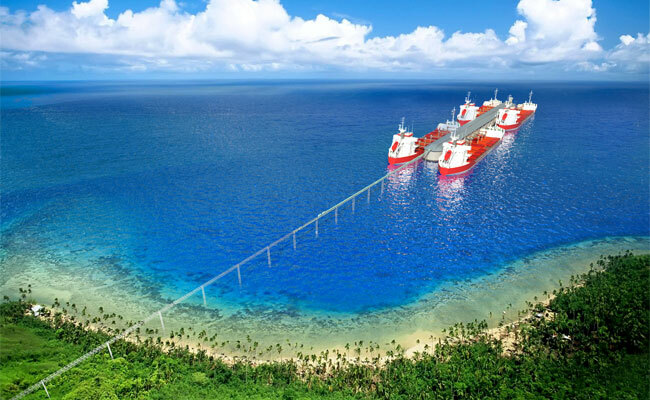 SkyWay sea port does not violate the terrain, biogeocoenosis and biodiversity neighborhood. 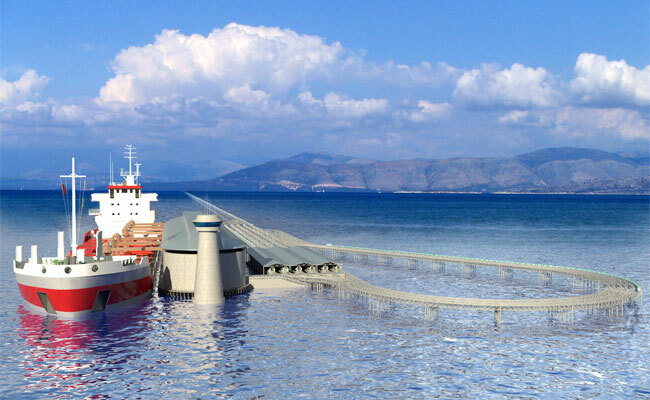 SkyWay sea port does not destroy the fertile soil and vegetation. The absence of large-volume open warehouses and piles of bulk cargo on shore (ore, coal and others) and in the coastal zone, which would be littered and polluted the environment. biogeocoenosis and biodiversity of the seabed in the port. Tsunami and tides in the open sea are not dangerous, because the wave height in them rarely exceed one meter. Sea port is not exposed to the surf due to his absence.